The hallowed grounds of my youth host DC United and the Columbus Crew tonight at 7:30 PM (8:30 PM in Buenos Aries, Argentina and 12:30 AM in Northamptonshire, England). • DC had a week off from MLS action but did host PSG (friendly). The club has hit a bit of a bad spell of late. • Alternatively, Crew have won 2 league matches in a row (including a 1:0 win over DC). • Crew have also won a Reserve game and a friendly against Stoke. Team spirits are soaring. • Columbus still haven't scored 3 goals in a league game. • They also have only allowed more than 2 goals once this year. Good Morning, let's get started with the MLS staff. Jason Saghini, Director of Video is the only one picking Columbus. Four of them are leaning DCU and one other calling for a Draw. Over on the betting sites we see DC getting a better than normal home advantage. Bet365 has DC 10/11 (fav) odds with a likely scoreline of 1:0 (2:0 or 1:1 after that). That WV Hooligan, Drew Epperley, has DC winning 1:0 as well. "Tempo will be huge in this game as well, something I think D.C. will bring from the start," says he. 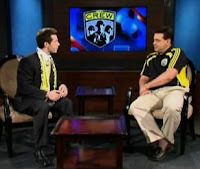 Locally, we've got Mr. Katzeman thinking "United are too good at home and the Crew are too inconsistent," 1:0 to DC. Ms. Eyer over at Pitch Fest, The Official blog of the Hudson Street Hooligans feels the Crew can get a point out of this one. 2:2 Draw. Mr. Dispatch Crew himself (Adam Jardy) shares Eyer's positive vibe and even steps it up a notch. In his preview this morning in the paper he thinks Jairo Arrieta's recent production could inspire the club on and give them "a chance at coming home with its longest winning streak of the season." First off... 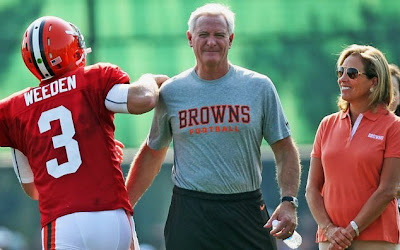 I think that 58 year old Mr. James Haslam III, new majority owner of the Cleveland Browns, looks like is able play starting QB if Brandon Weeden doesn't work out. He'd also make for a beast CDM for the Crew. The picture above has it all, man (Joshua Gunther up at the Plain Dealer took it). The star quarterback hustling past approvingly... the owners attractive wife looking pleased as punch and the owner who looks like General MacArthur did walking up Red Beach, Palo, Leyte and eats nails for breakfast - front and center. I'm ready to run through walls now, damn you NFL. 2nd off... The Crew are in the middle of good times and playing DC this time of the year is preferred over playing in a late season must win match like last year. Columbus has won four matches, in all competitions, in a row but each was against weakened clubs. A win is a win and no team is ever fully healthy (especially Columbus) but DC will be as close as you can get to 100% and will absolutely be putting the Crew on their back heels. Also, this... DC hasn't scored less than 3 goals at RFK since the middle of April. Here is what their home goals look like since then: 4, 3, 2, 3, 3, 3. Columbus has yet to score over 2 this year so the club's fullbacks and defensive mids better be ready to eat lightning and crap thunder tonight. A Mirosevic return tonight might not be a good idea. If ever there was a night to see Danny O'Rourke back, this would be it. The Crew are owned by a "sports group" so they can't get a pic like the one above. It's usually just dudes with suits. Unless you want to imagine Mark McCullers in there. Great things come from great leaders, folks. [UPDATE] Final, Crew 0:1 DC. David Burgin has a good recap here.